In 2010 Perry and I met friends for a theater trip adventure. We had tickets in the center of the third row for “Swan Lake” choreographed and directed by Matthew Bourne, who has won many awards. From London, his stage production was unique. He used male ballet dancers to perform the lead swan role and the swan ensemble instead of the traditional version which uses women dancers. This building tells you where we flew to meet our friends. Friday evening, we stayed in the Phoenix Park Hotel. After dinner, I leaned out our hotel room window to shoot this photo of the United States Capitol building. Then it was early to bed for an early rising. Thinsulate insulated Fall Leaves Kup Kollar on 24 ounce water bottle. After checking out of the hotel Saturday morning, we walked a short distance to the Union Train Station to eat breakfast. 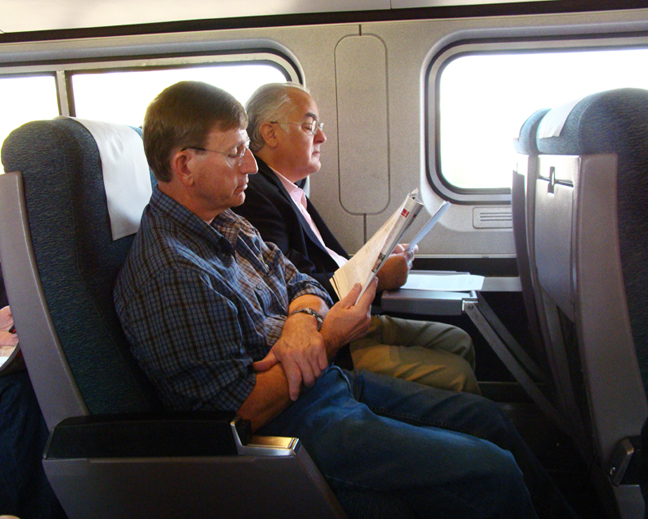 Then we boarded an Amtrak train for a four hour trip to New York City. Diane and I sat together and knitted pink washcloths to have souvenirs of the trip. We were in Pennsylvania when I took this photo. Wayne and Perry sat across the aisle. Perry read while Wayne worked on a written project. We all explored the train for seat breaks and enjoyed the window views of several states we traveled through on the east coast. Arriving early afternoon in NYC, we taxied to the Hilton Garden Inn Hotel. We unpacked, rested, and then dressed for dinner at the Sullivan Bistro. After eating a delicious meal, we taxied to the New York Center Theater to enjoy the beautiful production of “Swan Lake”. It was beyond my expectations in dance, costumes, and set. When the curtain opened for the cast bows, I had tears on my checks as I applauded. Birthday” to her for even more fun. Thinsulate insulated Fall Leaves Kup Kollar on 16 ounce iced tea glass. I ordered a delicious banana split and iced tea. Before catching a taxi back to the hotel we explored the area on foot. Sunday morning we ate a wonderful brunch at the Cupping Room Cafe then explored that area of Manhattan. I boarded the train Sunday evening with new yarn skeins from Purl Soho yarn shop in my suitcase but I was way too tired to knit traveling back to Washington DC!